If you had read my New York Nintendo Switch event, this will be an extension of what I said previously before and further my opinion about the Nintendo Switch and my hands on experience. So what can I add that hasn’t already been said? Well simply, the Switch is quite handy, mobile, and I can see myself with it anywhere I go. Having just about 4 hours with the Switch, it’s just as I remembered back when I first experienced back in the New York event. The size is small and fits in my hand very well (above image). Now not being chained to a demo station, I finally get to feel the main display unit fully, and overall, the build is not that bad. The matte exterior is a great touch and quite sleek alongside my PS4. There were some things that were a bit worrying, such is the kickstand in the back. It’s simple and gets the job done, just make sure the surface is even and no disturbance around it. Plus it exposes the micro SD card slot. 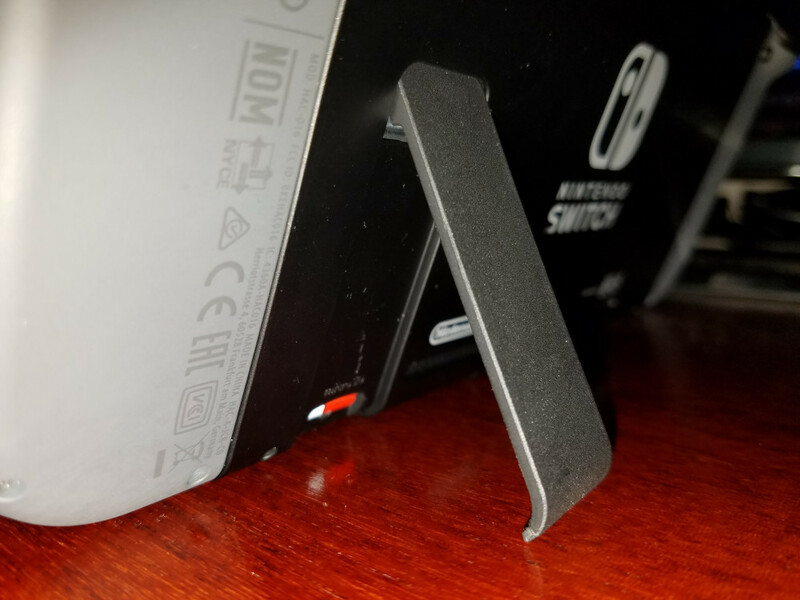 You would have thought that Nintendo would put the cover over the slot, beneath the kickstand but nope, it’s out there. It feels like an oversight on their part. Just as long there no agents for accidents, then you should be safe. Another aspect is the display screen, though it may be a personal opinion. I feel the unit is a pending dust/fingerprint/tragedy magnet. While I love the display and how crisp the picture is, I can’t help but worry if it will invite fingerprints or scratches. Worst case scenario if I bring it out and about, I drop it by accident and it either damages or breaks. I feel that you want a carrying case and a screen protector with you to ease any worries of this and practice safety behaviors with any device. Those are my current worries as of now, but not enough to disengage me from the Switch. As with playing with the joy-cons and with the Joy-grip, it felt free and natural. With the Joy-cons individually free, it was like playing with the Wii remotes again, but with free range to move around. When playing with Breath of the Wild, it was liberating to just stretch my arms and play however I wanted to. 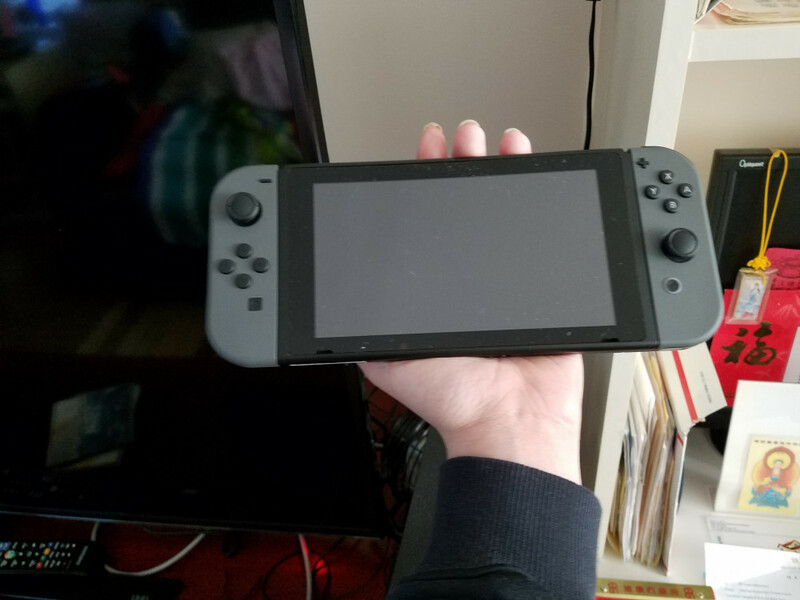 The Joy con themselves, though somewhat small, it feels to fit perfectly well in your hands. The grooves in the back are enough to give the feeling of control and stability. When attached to the grip, it gives you more stability should you require it. Perhaps I’ve been so using with the Wii U gamepad, but the right stick on the Joy-con on the bottom side is kinda foreign. I understand it’s similar to the Gamecube controller with the C-stick but when controlling the camera, it felt off. I’m used to the placement of stick right by my thumb for easy access so going out of my way with my right thumb feels unusual, to say the least, though this is just preference. I have adopted this new style, including the arrow buttons on the left Joy-con, but it will take some time before I’m fully accustomed to it. When attached to the grip, it gives you more stability should you require it. Perhaps I’ve been so use with the Wii U gamepad, but the right stick on the Joy-con on the bottom side is kinda foreign. I understand it’s similar to the Gamecube controller with the C-stick but when controlling the camera, it felt off. I’m use to the placement of stick right by my thumb for easy access so going out of my way with my right thumb feels unusual to say the least, though this is just preference. I have adopted this new style, including the arrow buttons on the left Joy-con, but it will take some time before I’m fully accustomed to it. Playing with it for 4 hours, I didn’t felt fatigue or any cramps in my fingers when either playing it in the handheld mode or other play options. Overall, this is a solid piece of hardware and it felt right in the general places. As mentioned in the beginning, there are some complaints from its kickstand and possible impending tragedies that can occur if not careful. As with all hardware, I say be careful, gentle and treat it like family. If you respect the Nintendo Switch, it will respect you.We’ll see down the line if it the hardware will endure and if it can withstand the test if time. Now if you excuse me, I’m going back into the Wild. Nintendo Switch is currently available now.